Megali Ammos will take you to Skiathos’ east coast, where you’ll find some of the island’s best beaches. It’s a 15-minute walk, or 5-minute drive, from Skiathos Town, giving you a quiet and tranquil retreat within easy reach of some of the best restaurants, bars, and shops in Skiathos. The town is set on a sweeping golden bay and has the iconic crystal clear waters of the Greek islands, as well as whitewashed buildings with terracotta roofs and pretty tavernas. Holidays in Megali Ammos are all about the opportunities to relax. It’s a small, relaxed town set right on the coast and within easy reach of the capital. Lovers of the island’s traditional style will find pretty architecture to admire, while explorers can hike or mountain bike in the surrounding forests. 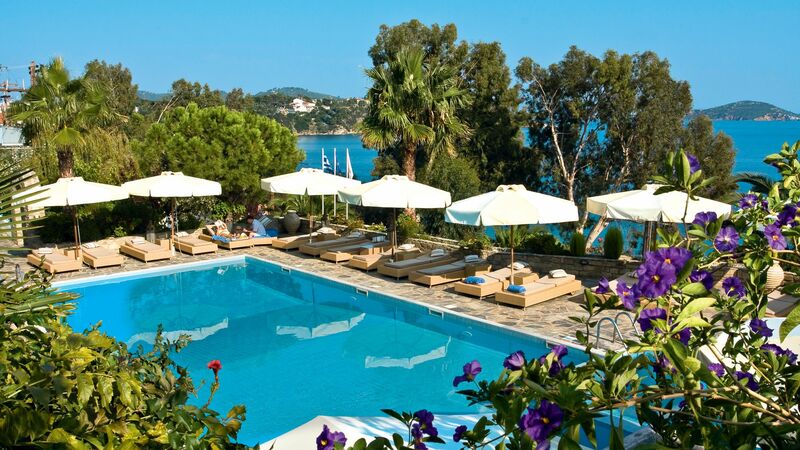 Head into Skiathos Town for theatres, museums, fine dining, and some excellent bars, or simply spend your days in Megali Ammos unwinding by the pool, on the beach or at the spa. Speak to one of our Trusted Advisers today and we’ll help you find the right hotel for your luxury Megali Ammos holidays. Whether you’re travelling as a couple, or solo, we'll carefully select the hotel that is the right option for you. Stay at the Aegean Suites for spectacular views, luscious gardens filled with flowers, rustic and elegant interiors, and some excellent cuisine. Skiathos Town is lovely, and just a short walk from Megali Ammos. It’s still very traditional in style, with a lively vibe and a great selection of shops, bars and restaurants. From the port, you can take a boat trip to some of the surrounding islands like Skopelos and Alonissos (which I’d highly recommend). The flight to Skiathos is around 3 hours 30 minutes from the UK. Transfer time from Skiathos airport to Megali Ammos is approximately 10 minutes. Skiathos enjoys long, hot summers with reliable sunshine from May all the way to September or October. The spring and autumn months are warm enough for beach days, but July and August is when temperatures soar, regularly hitting 30°C.